I recently downloaded Frank Turner’s (relatively) new album, England Keep My Bones and was delighted to find what is now my favorite hymn! I will never fathom how marketing comes up with brand names for Rx drugs. Anyway, the FDA officially approved telaprevir (see post below) on Monday, May 23. This week, panels of non-FDA experts reviewed the clinical data for Merck’s* boceprevir and Vertex’s telaprevir for potential market approval as first-in-class** treatments for patients infected with hepatitis C.
Are telaprevir and boceprevir perfect drugs? No. Each has side effects. There are the proven side effects of Xarelto even. I’ll note, however, that the “nasty rash,” the most common adverse effect (AE) of telaprevir, was generally mild to moderate and treatable with antihistamines or corticosteroid creams. Only 2% of subjects discontinued treatment because of the rash. So it’s an AE that is tolerable. The drugs will also be quite expensive: $35-40K per course of treatment. Yikes almighty! Yet these are complex molecules that are not facile to synthesize. Also, consider that a liver transplant costs in the order of $250K to $310K (and higher). That’s the structure of “my baby” above. Of course, it’s not strictly mine. Not by a long shot, but with all the work I did on that molecule, I feel like one of its many parents. We had a hell of a team at Vertex, and there’s a critical piece of the molecule that was added by Mark T., a wicked smart medicinal chemist, who was then at Lilly (former collaborators; Lilly and Vertex had, uh, differences in approach and thus had a fairly amicable divorce). My contribution was to study the detailed inhibition kinetics of VX-950, using isolated HCV protease for in vitro assays. I demonstrated that VX-950 was a slow binding inhibitor with a slow off-rate. It’s sticky in other words, and hangs onto the the protease for a good while before being hydrolyzed off the enzyme by water in the cell. The close teamwork of biochemists/enzymologists and virologists at Vertex proved to be a very powerful combination. The virology team was able to demonstrate the efficacy of the protease inhibition in their viral RNA replication assay, and that the slow off-rate appears to play a role. 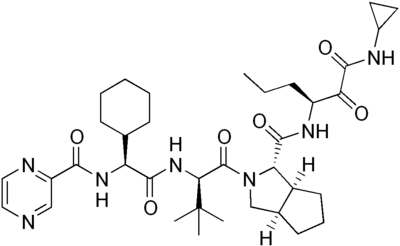 These experiments were performed in 2003/2004, and became pivotal elements of the package, which included major contributions from medicinal chemistry, protein chemistry, process chemistry, toxicology, and pharmacokinetics, which brought VX-950 (telaprevir) forward as a clinical candidate. And now…well, I wonder what its brand name will be? The odds of a compound at the bench becoming a drug are incredibly small, e.g., for every 10,000 compounds that enter the drug discovery pipeline, only 250 will progress to pre-clinical development (2.5-5%); 5 move forward into human testing, Phase I studies (0.1-0.5%); and only a single compound will survive through Phase II and Phase III studies to be an approved drug (0.01%). So this is a rare thing, and telaprevir is not just any drug. It will meet a significant unmet medical need. Anyway, forgive me for so much gratuitous backslapping, but I’m proud to have been part of the team — a great group of scientists, many of whom (including myself) no longer work at Vertex — who discovered the compound and brought it to clinical candidate status. *Boceprevir is actually from the former Schering-Plough, which Merck acquired. ** Strictly speaking, boceprevir is the first approved HCV protease inhibitor and thus truly “first-in-class,” but I use the phrase collectively here, as the approvals were almost back-to-back. How this atheist celebrates Easter. 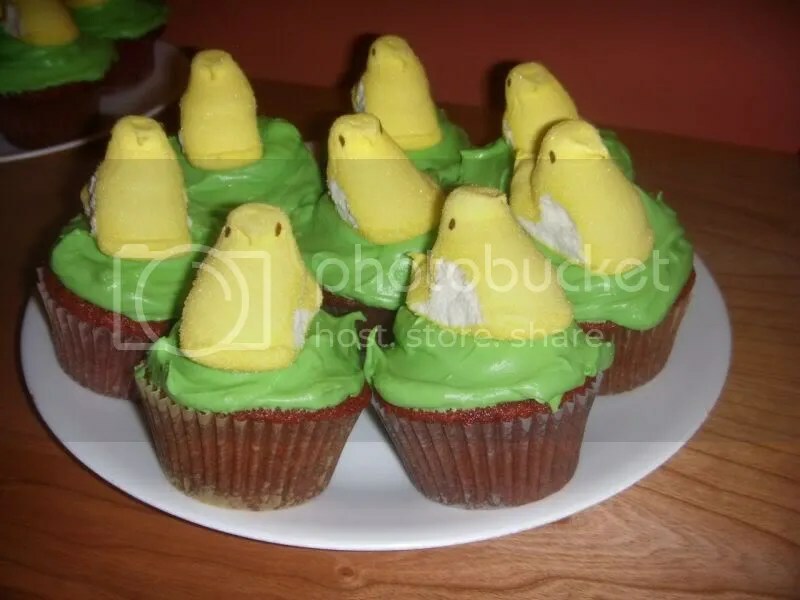 She celebrates it with grilled leg of lamb, the company of loved ones, a respectful nod to her friends and family counted amongst the Rational Faithful, and with these scary, scary Peep cupcakes. Yes. Yes, I made these carcinogenic little morsels. About a gazillion of my fellow scientist-pop culture aficionados have picked up on this fabulofuckingbrilliant parody of Lady Gaga’s “Bad Romance” by now, but what the hey. I’m posting it for posterity. Many who were/are professors’ slaves graduate students in chemistry, biology, etc. laboratories can relate… ’cause it’s painfully true. The details of the costumes are great — the orange biohazard bags especially. Something of a send-up of a homely fireside chat complete with the warmth of the hearth, the obligatory cat, and the old Oxford don all comfy with his Mac on his lap in lieu of a stack of parchment. It would have been far more effective had the derisive laughter and puerile giggling in the background been edited out. That’s just embarrassing. This video has been around for a while, but with a nod to Thanksgiving, this surely makes me thankful that all I have to do is negotiate traffic on the Boston-Providence Highway to stalk the wily strip steak at Whole Paycheck. About 8 and a half minutes long. There are many little quizzes and bits out there in the ether that are about as accurate as a Magic Eight Ball or astrology, but nonetheless fun. Here’s the result of one I indulged in this morning. Surely with tastes that favor Islamic art, I will be put on someone’s list of Enemies o’ the State. But the real question is, how come these descriptors are always positive? I’ll bet that I if used a random number generator to create the responses, it would never come back with: Irritating, Back-biting, Dullard. So, have any Chimp Refuge readers (all 10 of you) stumbled across a quiz that will parse one’s assholishness? 21 Islamic, 19 Impressionist, 8 Ukiyo-e, -27 Cubist, -29 Abstract and 9 Renaissance! Best cover of Led Zeppelin’s “Immigrant Song” ever. From New Orleans-based funk and jazz band Galactic with Boots Riley, Chali 2na, and Laidlaw. Yeah, yeah, I know. This is a drive-by post, but the new gig and unpacking have me pretty well knackered. Well, I love that dirty water…Oh, Boston, you’re my home! Or rather it will be soon (again). Hello there. Doc Bushwell, effectively erstwhile bonobo-matriarch here with a bit of good news. Last Wednesday evening, I signed the written offer for a new job: that of regulatory medical writer at a major biotechnology company in Cambridge, MA with a tentative starting date of July 26. On Thursday, I quietly scuttled off at lunchtime to go pee in a cup for the pre-employment drug screen. On Friday, I gave 2 weeks notice to my current employer. When I moved to New Jersey in 2004, I told myself that my long-term plans included moving back to the Boston area. So this is happening just a bit sooner. The family is gung-ho about returning even if the move will be a freakin’ nightmare. Well, most moves are like that. I’ll miss certain things about Jersey: martinis at Mediterra in Princeton with my friends, ripe tomatoes, sweet corn and peaches (oh, those Jersey peaches! ), the ability to visit NYC easily, and walks through the woods that border my home. My current employer, a small CRO that focuses on oncology clinical trials, provided excellent training for me, and I have considered these past two years with the company to be much like a post-doc. Nonetheless, whenever I left Boston after visits over these past six years, I always felt melancholy as if I were leaving my hometown to return to a place where I really did not quite belong. But now? Well, it feels like I am going home again: I’m shipping up to Boston! An e-mail this morning from one of my former Univ. of Wisconsin-Madison classmates informed me that JoAnne Stubbe, Novartis Professor of Chemistry, Professor of Biology at the Massachusetts Institute of Technology, and who was the first woman to achieve tenure in the biochemistry department at the UW-Madison, received the National Medal of Science from Barack Obama yesterday. JoAnne is a fiercely brilliant woman who intimidated the bejeebus out of me when I was a fledgling grad student and later as a callow post-doc. She was one of five professors (including my advisor) who raked us over the coals during student research seminars. I also faced her wrath when I overtightened the valve to her lab’s French press. But later, when out and about in the real world, my encounters with Professor Stubbe were nothing but good. She’s funny, intense, and passionate about science. She’s a superb intellectual role model, and even though she was not my advisor, she nonetheless influenced me along with many of us in the biochem. department at the UW-Madison. Her award is a such fantastic and well-deserved achievement! She was at the vanguard of women entering academia and industry in disciplines like chemistry and physics which were long dominated (and still dominated) by men, but these awards as well as the Nobels with 3 women winners in the sciences this year, including Elizabeth Blackburn and Carol Greider for telomeres/telomerase, indicate that “an old girls” network is forming at last. Here’s a link to the article in the Boston Globe about JoAnne. Her picture receiving the medal is here in the White House blog (scroll down) and below the cut is the press release (see bolded type a ways down for JoAnne’s award). For me, Creation, a much anticipated movie about Charles and Emma Darwin (based on Annie’s Box: Charles Darwin, his Daughter, and Human Evolution by Randal Keynes, Darwin’s great-great grandson) is — or rather was — a must-see flick. It premiered this weekend at the Toronto International Film Festival. Paul Bettany is cast as Darwin. Bettany is a versatile actor whose performances have always impressed me, e.g., his roles as Dr. Stephen Maturin in Master and Commander: The Far Side of the World and John Nash’s imaginary friend in A Beautiful Mind (John Nash cinematic fan fiction at its most “interpretative”) among many. Jennifer Connelly (Bettany’s wife) — a lovely actress (Pollock, House of Sand and Fog, and A Beautiful Mind) is cast as Emma. Darwin the man (as well as Darwin the naturalist) has long intrigued me. A few years ago, the American Museum of Natural History in NYC (where my great-great uncle — a paleontologist — had been a curator for a time) had a special exhibit of Darwin’s collections and notes, including a replica of his study. I took my kids to see it on February 12 — Darwin’s birthday a.k.a. “Darwin Day.” To see the notes that he had written with his own hand was marvelous and truly sent shivers down my spine. Olivia Judson wrote a wonderful essay on Creation in her blogThe Wild Side, hosted by the New York Times. Judson’s eloquent essay further reinforced my desire to see the flick. So yesterday afternoon, when my spawn and I were on our way to see Ponyo (a feast for the eyes: gorgeous color and images, all dream-like with those delightful characters and weird touches I have come to expect from Hiyao Miyazaki), we talked about the upcoming Creation film with no little excitement. However, my 18 year old daughter wondered aloud if the film would be released in all markets in the United States. Charles Darwin film ‘too controversial’ for religious America. When I was growing up, I was a member of the United Methodist Church. My favorite minister was “Reverend Mac,” a gifted speaker and a scholarly man (almost rabbinical!) who was also the substitute science teacher at my public high school. He embraced the theory of evolution and the entire concept of a universe that is billions of years old. As one of the Faithful, he did not see such concepts as incompatible with an Abrahamic God. In his mind, these added to the mystery and glory of God rather than negating the idea. He even brought beautiful scientific imagery into his sermons — for example that laws of physics that govern an atom’s motion and that of a galaxy. So that is what I grew up with as well as a household where evolution was considered fact. That is what I thought was theologically “normal.” Many of my Roman Catholic pals were taught much the same way. In essence, we (as kids) were already experiencing what the late Stephen Jay Gould called “separate magisteria,” that is Faith and Science in parallel — not overlapping but co-existing. Now, as an atheist, I respect the beliefs of the Rational Faithful — like Rev. Mac and many others I know for whom science poses no difficulty in their faith in God and who honor the concept of non-overlapping magisteria — even if I have no need for belief in the supernatural. Again, I (naively) tend to think that is what most believers are like. Apparently that is not the case in the United States. The lack of balls on the part of US distributors is appalling. I had anticipated the possibility of limited distribution, that is, the film would not make it to markets in certain areas of the country, but I fully expected it would show in venues like the Angelika in NYC or the Garden Theater here in Princeton or the Kendall in Cambridge among many of the independent US theaters in the Northeast, the West Coast and certain areas of the Midwest. Maybe in Houston, too. But not distributed AT ALL!? Does the Christian Right have that much power in this country such that US film distributors cave into their lunacy? That smacks of an especially horrific censorship. Yet Mel Gibson’s bloody Passion of the Christ was A-OK.
Here’s a trailer for Creation. Enjoy it. It may be the only bits we idiot Americans will get to see. My great-great uncle was told to resign from the faculty of Butler University because he embraced Darwin’s theory. He went on to work at the AMNH in NYC and the Carnegie Institute in Washington DC. He published a number of monographs on the vertebrate paleofaunas of North America, and a big tome (800+ pages) on fossil vertebrates of North America and the Pleistocene of North America. This popped up on New Scientist’s online news this morning: Christians battle each other over evolution by Amanda Gefter. So the Discovery Institute insists that to be a Christian means that theory of evolution must be rejected as espoused in their new Faith and Evolution web site. The web site, Geftner speculates, may be a response to Francis Collin’s launch of the BioLogos Foundation. Collins and crew — with funding from the Templeton Foundation — are proponents of theistic evolution which purports that the supreme being of Christianity chose to create life via evolution. That actually sounds much like the belief of the minister of my childhood church (United Methodist). Rev. M. loved science, was fascinated by modern cosmology, embraced the theory of evolution, and in fact was a substitute science teacher at my high school. I daresay he’d look askance at being told he could not be a Christian for his scientific inclinations. Strictly speaking, he was a creationist (divine hand behind the Big Bang, etc.). I recall a sermon in which he compared the imagery of an atom to a galaxy (a loose connection to physical laws) as a tribute to the Christian supreme being. To his credit, he never conflated God with science in the public high school classroom. So even if the magisteria of faith and science might have become entangled when he stood at the pulpit, they certainly did not when he spoke in the secular public arena. So this is what concerns me about Francis Collins. He’s speaking from the pulpit on BioLogos — analogous to Rev. M’s paean to God via atoms to galaxies. However, Collins is rumored to be a potential pick for head of the NIH. Will he be able to keep the magisteria non-overlapping in a secular venue? To echo Gefter, allowing the magisteria of faith and science to become entangled serves neither well. The DI’ers and BioLogos just conflate them in different ways. Last week, New York State Attorney General Andrew Cuomo hauled Bank of America chief Ken Lewis into his office to explain who, exactly, received an aggregate several billion dollars in bonuses late in 2008 after the US Treasury forked over billions of dollars in TARP money to his bank. That was a good start. Mr. Lewis, being lawyered-up to the max, had the temerity to reply that answering the question would compromise his ability to keep talented people in his employ. For that impertinence alone, Mr. Lewis ought to be dragged over fifteen miles of broken chardonnay bottles behind a GMC Yukon — but that is not how we do things in American jurisprudence. To be more realistic, a simple indictment would be in order, and then Mr. Lewis can answer this question, and a few others, in the comfort of an air-conditioned courtroom. Ultimately, that might lead to Mr. Lewis becoming the wife of a bodybuilder in one of New York State’s houses of correction — a just outcome that would go far in rejiggering the nation’s expectations about how people in authority ought to behave. And such an outcome might lead to the conviction of many other brides-to-be from the Wall Street debutante pool. [R]idicule and anger have a time-honoured role in social change. You’re confusing what is effective (sometimes) in dealing with people one on one with what is effective in changing the social climate en masse. In many cases people’s idiotic beliefs are too entrenched to be amenable to reason, evidence, or polite discussion. The only way to prod such a person into reconsidering their views is to convey to them that those views have made them a laughingstock and/or object of contempt. Attitude change is not fundamentally a rational process. You want to be a “good ambassador” – a nice guy in other words. That’s a valid and useful role and it obviously suits your personality better than snarkiness. But the snark brigade is not working at cross purposes to you. History strongly suggests that their role is essential in softening people up for your more polite form of persuasion. The good cop needs the bad cop for the routine to work. Name one social change movement that succeeded through polite persuasion alone. What you’re comfortable with is not the measure of what works.